MLYNEK, P. , HASIRCI, Z. , MISUREC, J. , FUJDIAK, R.
The paper deals with simulations of power line channel transfer functions in Network Simulator version 3. Firstly, an empirical model and calculation of the channel transfer function are given to reflect the necessity of channel transfer function for Power Line Communication system design. The framework for Power Line Communication in Network Simulator version 3 and then the necessary extension implementation are introduced. Other simulators are also mentioned. Secondly, various scenarios were implemented for the analysis and simulation of power line channel transfer functions. New scenarios for large topologies and for different approaches to calculate primary parameters were created. In the simulations, various kinds of topologies are considered for an analysis of the power line transfer function. The simulation part also focuses on the simulation of channel transfer function where the time- and frequency-selective impedances are considered. Finally, the last part focuses on measurements and a comparison of the simulation results with real measurements are given. X. Fang, S. Misra, G. Xue, D. Yang, "Smart Grid - The New and Improved Power Grid: A Survey," IEEE Communications Surveys & Tutorials, vol. 14, no. 4, pp. 944-980, 2012. S. Galli, O. Logvinov, "Recent Developments in the Standardization of Power Line Communications within the IEEE," IEEE Communications Magazine, vol. 46, no. 7, pp. 64-71, 2008. S. Galli, A. Scaglione, Z. Wang, "For the Grid and Through the Grid: The Role of Power Line Communications in the Smart Grid," Proceedings of the IEEE, vol. 99, no. 6, pp. 998-1027, 2011. M. Hoch, "Comparison of PLC G3 and PRIME," in Proc. of IEEE International Symposium on Power Line Communications and Its Applications (ISPLC '11), Udine, Italy, 2011, pp. 165-169. K. Kyong-Hoe, L. Han-Byul, L. Yong-Hwan, K. Seong-Cheol, "PHY abstraction methodology for the performance evaluation of PLC channels," in 2010 IEEE International Symposium on Power Line Communications and Its Applications (ISPLC), 2010, pp.28-32. O. Bouchet, M. El Tabach, M. Wolf, D. O'brien, G. Faulkner, J. Walewski, S. Randel, M. Franke, S. Nerreter, K. Langer, J. Grubor, T. Kamalakis, "Hybrid wireless optics (HWO): Building the next-generation home network," in 6th International Symposium on Communication Systems, Networks and Digital Signal Processing (CNSDSP), 2008, pp. 283-287. P. Oksa, M. Soini, L. Sydanheimo, M. Kivikoski, "Considerations of Using Power Line Communication in the AMR System," in Proceedings of the IEEE International Symposium on Power Line Communications and Its Applications, 2006, pp. 208-211. P. Mlynek, J. Misurec, M. Koutny, P. Silhavy, "Two-port network transfer function for power line topology modelling," Radioengineering, vol. 21, no. 1, pp. 356-363, 2012. G. Marrocco, D. Statovci, S. Trautmann, "A PLC broadband channel simulator for indoor communications," in Proceedings of IEEE International Symposium on Power Line Communications and Its Applications, 2013, Johannesburg, South Africa, pp. 321-326. L. Jong-Joo, Ch. Jae-Sang, S. Myong-Chul, K. Hak-Man, "Adaptive modulation based power line communication system," in Proceedings of Advances in Intelligent Computing - Volume Part II (ICIC'05), H. De-Shuang, Z. Xiao-Ping, H. Guang-Bin (Eds. ), Vol. Part II. Springer-Verlag, Berlin, Heidelberg, pp. 704-712, 2005. G. Bumiller, M. Sebeck, "Power-Line Analysing Tool for Channel Estimation, Channel Emulation and Evaluation of Communication Systems," in Proceedings of the ISPLC'99. Germany, 1999. Feng, R. Method and system for managing line topology [patent]. US 2011/0058502. 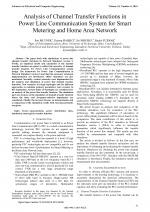 J. LeClare, N. Afshin, L. Victor, "An Overview, History, and Formation of IEEE P1901.2 for Narrowband OFDM PLC," 2013, Maxim Integrated Products, Inc.
 F. Canete, J. Cortes, L., J. Entrambasaguas, "A channel model proposal for indoor power line communications," IEEE Communication Magazine, vol. 49, no. 12, pp. 166-174, 2011. G. Marocco, D. Statovci, FTW Forschungszentrum Telekommunikation, FTW PLC Simulator. Wien, 2012. G. Marrocco, D. Statovci, and S. Trautmann, "A PLC broadband channel simulator for indoor communications," in IEEE International Symposium on Power Line Communication (ISPLC), Johannesburg, South Africa, 2013. S. Galli, A. Scaglione, "Discrete-Time Block Models for Transmission Line Channels: Static and Doubly Selective Cases," Cornell University Library, 2011. P. Mlynek, J. Misurec, M. Koutny, "Hybrid Power Line Model based on Frequency and Time-Variant System," in Proceedings of the 5th Global Information Infrastructure and Networking Symposium, 2013. Trento, Italy, pp. 1-3. S. Galli, "Simple Two-Tap Statistical Model for the Power Line Channel," in IEEE International Symposium on Power-Line Communications and its Applications, ISPLC 2010, Brazil, 2010, pp. 242-248. F. J. C. Corripio, J. A. C. Arrabal, L. D. del Rio, J. T. E. Munoz, "Analysis of the Cyclic Short-Term Variation of Indoor Power-Line Channels," IEEE JSAC, vol. 24, no. 7, 2006, pp. 1327-1338. P. Mlynek, J. Misurec, M. Koutny, "Random channel generator for indoor power line communication," Measurement Science Review, vol. 13, no. 4, pp. 206-213, 2013. F. Aalamifar, A. Schloegl, D. Harris, L. Lampe, "Modelling Power Line Communication Using Network Simulator-3," in IEEE Global Communications Conference (GLOBECOM), Atlanta, GA, USA, 2013. I. Tsokalo, R. Radeke, R. Lehnert, "G.hn network simulator, calibration and simulation results," in 18th IEEE International Symposium on Power Line Communications and its Applications (ISPLC), pp.93-98, 2014. I. Tsokalo, R. Lehnert, "Modeling approach of broadband in-home PLC in network simulator 3," in International Symposium on Power Line Communications and its Applications (ISPLC), pp.113-118, 2015. I. Papaleonidopoulos, C. Karagiannopoulos, N. Theodorou, C. Anagnostopoulos, I. Anagnostopoulos, "Modelling of indoor low voltage power-line cables in the high frequency range," in International Symposium on Power Line Communications and Its Applications, Athens, Greece, 2002, pp. 267-271. H. Meng, S. Chen, Y. Guan, C. Law, P. So, E. Gunawan, T. Lie, "A transmission line model for high-frequency power line communication channel," in Proceedings of International Conference on Power System Technology, 2002, pp. 1290-1295. 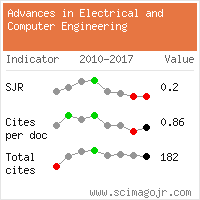 P. Mlynek, J. Misurec, M. Koutny, R. Fujdiak, T. Jedlicka, "Analysis and Experimental Evaluation of Power Line Transmission Parameters for Power Line Communication," Measurement Science Review, vol. 15, no.2, pp. 64-71, 2015. Citations for references updated on 2019-04-21 18:28 in 143 seconds.